I just finished assembling my PDM Generator and need some help understanding what I have. I am not sure I even know about this to know how to tell if it's working. The output is only about 50mv p-p and I assume it should be either 5v or 12v depending on the position of the switch. In the other position of the switch, all I get is a much bigger triangle wave of constant amplitude. So, I assume something is not right here. Another question I have is the "feed forward" and 47k to the power supply. What does this mean and what power supply. What revision board are you using? You connect a 47k resistor to your HV DC (125 to 130vdc) supply, to the point on the board.. This allows you to "null out" the PWM power supply ripple... if there is any. BTW: I used your wooden telescope mirror cell design from your website for my "sauna-tube" 8inch F6 scope..
first ever build... didn't grind the mirrors or any of that... but it is fun to play with! 1. There was a sync problem with the camera and I could only get a little tail at one end. 2. I started to smell something and quit. No smell in 5v position. 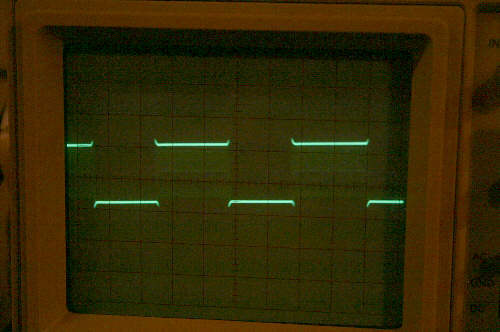 What I see in the 12v position is a much larger and slower triangle wave. Roger on the mirror cell. That was another (of many) lives. I guess I'd try clipping the scope onto pin 4 of the generator IC, see what's there... in both posistions..
Maybe the smell was the resistor (50ohm...) ? I was just curious... I see three wires to the line-input... are you using balanced audio? 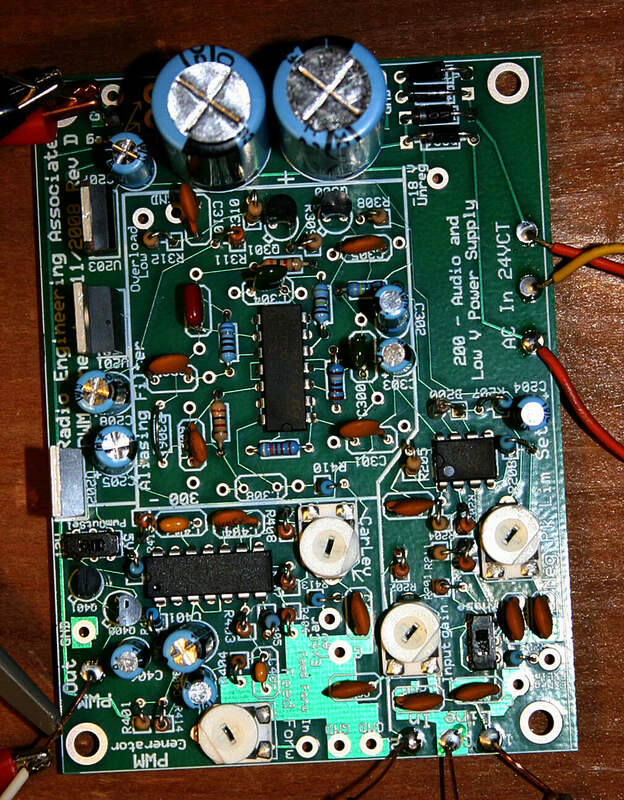 Looking at your board, I bet you haven't done this........because I see no solder, or signs of a temporary connection. You need to put +5 vdc at the "overload low" connection in order to turn the pwm on. The overload line should "float" and allow the generator to produce output in the absence of an overload low signal... More later ! The feed forward takes a sample of the power supply [ripple] and feeds it "forward" into the PWM generator out of phase with the actual power supply ripple. So, in essence, you put power supply ripple onto the pulse train, cancelling some of the power supply ripple which would otherwise appear in the resultant output (after the filter). It will definitely reduce power supply ripple in the output (if it is there), but generally this is not an issue at all. I don't actually use the feed forward in my own transmitters, but I have used it in the past when I had a poorly filtered HV supply. Uggh! I assumed the tab was left over from a TO5 can and pushed the center lead back and lined them up with the hole pattern. I already removed the NPN to check it out, leaned nothing and came in for dinner. I will download the data sheets and make sure I get them right but I don't think I can salvage the one I pulled out. I got them out and turned around but the PNP gets very hot so I must have fried it. Will check with Radio Shack in the morning to see if the local has one. Guess I got lucky with the other pair. As a suggestion, a "D" profile on the board would have saved a lot of grief. I am not sure what to call a hand held, battery operated audio generator so I tried it both ways. The regular audio chain is balanced. steve_qix wrote: The overload line should "float" and allow the generator to produce output in the absence of an overload low signal... More later ! I thought the ol board sets that pin to +5 volts during transmit? Oh well... I don't have one that is operational, so I couldn't test the theory. Plus, well, you designed it, so I guess you'd know. The measured value is about 3v so I presume this is enough to hold it on. The measured value is 3v ? You're measuring the base of a transistor with NO bias. Well, the circuit puts a positive voltage on the emitter of PNP transistor Q301. The base of Q301 (overload low) is floating, and has a bypass cap to reduce the possibity of RF getting into the circuit. So, with the base Q301 floating (0 base current), the collector of Q301 will be pulled low (to -12V) by R309, shutting Q300 off. When the base of Q301 (overload low) is pulled low, current flows through the base-emitter junction, turning the transistor on. This pulls current through the base-emitter junction of Q300, turning the transistor on, pulling the audio line looking into the anti-aliasing filter to -12V, which appears at the output of the DC coupled filter, cutting off the pulse train. By the way, Jack - Q300 and Q301 appear to have been installed correctly.